The AA&R (Accounting, Auditing, and Reporting) Event, which has been held annually since 2014, is an informative networking event that highlights mega trends in accounting, auditing, and reporting topics and their career implications. The event is a great learning opportunity and serves as a way to network with professionals, recruiters, and Beta Alpha Psi alumni. 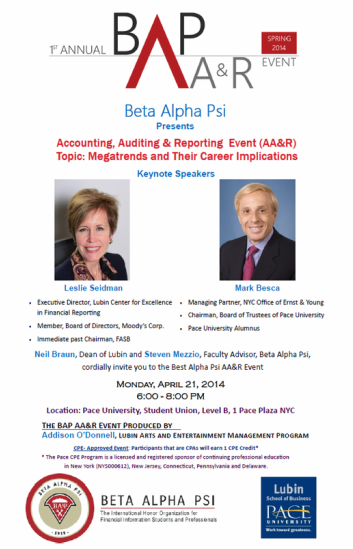 Guests at the event include keynote speakers that are experts in accounting, auditing, or reporting, alumni, recruiters, and students.